Aviation fans and experienced or aspiring pilots of any age will enjoy these entertaining stories from a successful charter pilot. Anyone interested in general aviation, its history, and the funny and sometimes-scary adventures of a professional pilot will enjoy Mark Burgess' stories. With wry humor he takes us on his journey from an airplane-happy small-town youth, to certified pilot at age 17, to instructor and inspector of other pilots. He has flown donated organs, fire patrol, the rich and famous, and today is a successful entrepreneur with a rapidly growing company employing nine charter pilots. This book is part explanation of things you can do in aviation (without getting shot at), part personal story, and a liberal sprinkling of funny tales to give a glimpse into what happens and why in the exclusive world of general aviation. In the process he also witnessed escapades of well-known passengers and enjoyed spending other people’s money on luxurious lifestyles including skiing, roaming on motorcycles, deep-sea fishing and remote vacation locations. With wry humor Mark A. Burgess reveals his journey from an airplane-happy youth in a small Ozarks town to become a certified pilot at age 17, then an instructor and inspector of other pilots. 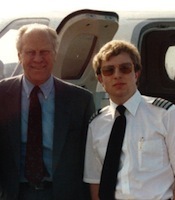 Today he is a successful entrepreneur with a rapidly growing charter company that employs nine pilots.